Welshpool Church in Wales have been working hard to develop playtimes that support pupils to socialise. Their aim is to develop pupils’ social-emotional well-being, so they can manage all aspects of life. The school has developed Zone Leaders who support children in play in different areas of the playground, including a Creative Zone, Games Zone, and a Ball Game Zone. There is a Cwtch (hug / safe) Room where children who have particular difficulties in making healthy friendships can go to take part in nurturing activities alongside trained staff. In order to enhance children’s play further, the school wanted to develop a Construction Zone! This area would store a range of loose parts, such as cardboard tubes, tyres, lengths of material, netting, ropes, crates and other scrap material which would extend the choices and possibilities of play for the children. The theory of “loose parts” was first proposed by architect Simon Nicholson in the 1970’s has begun to influence child-play experts. Nicholson believed that it is the ‘loose parts’ in our environment that empower creativity. In play, loose parts are materials that can be moved, carried, combined, redesigned, lined up, and taken apart and put back together in multiple ways. They are materials with no specific set of directions that can be used alone or combined with other materials. 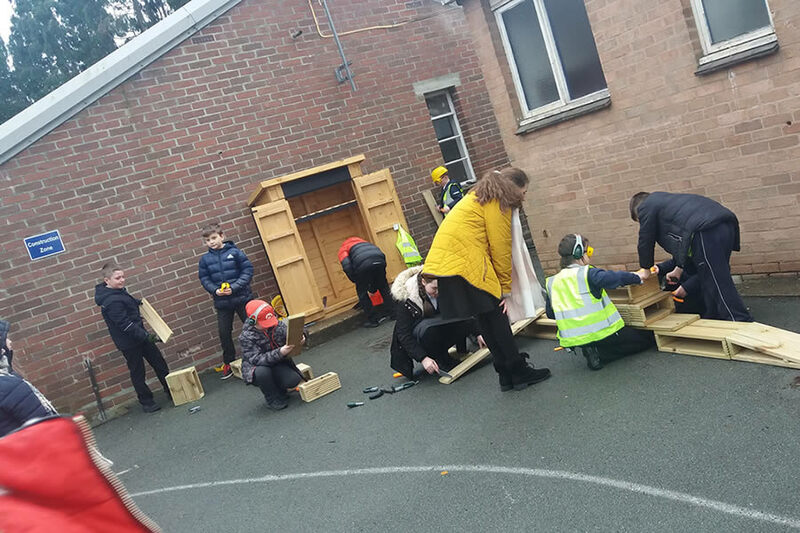 Welshpool wanted a Builder’s Shed that would store these loose parts, so that in combination with children’s inventiveness and creativity, play and socialisation amongst all ages, genders, and abilities could flourish. Andrea Guerin, Resident Liaison Coordinator from Powys County Council Housing Department, contacted their appointed contractors who are carrying out improvements to Council properties in the area, to see if any contractor would support the initiative via the Community Benefits they are required to carry out as part of their Contracts. Community Benefits are about giving back extra to the communities in which they carry out work.